Blue Bloods, the CBS TV series about the New York Police Department starring Tom Selleck, may be the best Christian drama on television. I know that seems like an odd thing to say, but let me elaborate. Blue Bloods premiered on CBS in 2010 and has remained a Friday night staple since, with a viewership of 10-13 million weekly. While there is always the police versus criminal element in the show, much of the drama surrounds the Reagan family, four generations of law enforcement in NYC. Frank (Tom Selleck) is now the Police commissioner, the Top Cop, of NYC, after serving on the force his entire adult life. His father Henry (Len Cariou) had also been police commissioner, but is now retired. Both father and son are widowed. 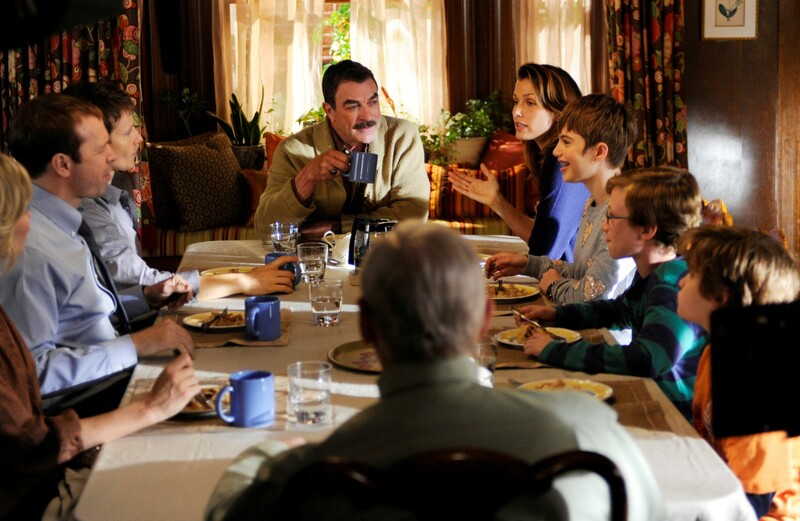 Frank has three grown children: Danny (Donnie Wahlberg), Erin (Bridget Moynahan), and Jamie (Will Estes). Danny is a top detective though highly volatile. Erin is a rising Assistant District Attorney, and Jamie is a Harvard graduate with a law degree who has given up law to take up the “family business” as a beat cop. Another son Joe was murdered in the line of duty before the series opened, a loss that is always close to the surface in this very tight-knit family. Danny is married to Linda (Amy Carlson) and they have two sons. Erin is divorced and is raising teenage daughter Nicky (Sami Gayle), a good girl but very strong-minded, and Jamie is very eligible. Every Sunday this entire family sits down to dinner together. Every episode includes this often moving, sometimes humorous, and occasionally tense intersection of the family’s personal and professional lives. And every meal begins with a prayer! The Reagan family is Irish Catholic, and they are devout, not in the maudlin manner of Christian TV with everyone holding hands in church, but in what I believe is a more realistic way, in a way that affects every minute of their lives. Sure, there are often references at the dinner table about the homily at Mass that day, and sure, their saying grace is sometimes just a simple family ritual—but there is an assumption in this family that their faith is real and that it is an omnipresent, all-encompassing framework for both their private and their public lives. And that is why I think Blue Bloods might be the best Christian program on TV! As police officers, all of them face moral dilemmas almost daily. Does the right outcome justify using any means to achieve it? Is life fair when the victims of crime lose and the “perps” walk free on legal technicalities? When does one keep the letter of the law or opt for the spirit of the law? Last week’s episode was especially interesting, involving a detective who was cleaning up neighborhoods of drugs, but then buying up the drug houses, cleaning them up, and flipping them for a big personal profit. After being investigated by Internal Affairs, no one could find anything illegal about this cop’s actions, but Frank maintained it was wrong, even if it wasn’t illegal! His moral point was that the police must use a higher standard than just the criminal code to evaluate themselves. Not everyone agrees with him—and so the ethical and moral debate characteristic of almost every episode begins. Of course, there is family drama as well: Will Danny be tempted to be unfaithful by women he meets in the line of duty? Will he cross boundaries in trying to get justice? Erin and Nicky have the usual single Mom versus teenage daughter issues, and Jamie has such a soft heart—the heart of a priest, as they say in one episode—that he is often in conflict with what is right legally and what is compassionate. These are not perfect people. All of them make choices that you wish they had not made, but don’t we all! The show is almost completely free of profanity—almost—which is refreshing. You can actually admire all of the main characters. The action and drama are absolutely engaging. Evil is always evil and never good. That fact sets this show apart from almost all drama in our increasingly amoral culture. And God has a lead role. If you have Catholic hang-ups, get over them and be thankful for a TV show that shows serious believers, practicing their faith publically and privately in the real world. Be thankful for people who believe in truth. Be thankful for people who pray. Previous seasons of Blue Bloods are available on Netflix and Amazon–maybe others as well. Mark. I enjoyed your article. At the end of each episode, we say that was a good show. Another favorite show is Downton Abby. Fine article, Mark. I watched this show in the past and really liked it but haven’t seen it in a long time. After reading your article, I’ll watch again and maybe get my better half to watch with me! Thanks.